Holy Thespis, Venice is sick! This new musical, currently at the Public Theater, is a rock and roll hip-hopera that uses modern music (love the great grooves and dope beats) to tell a classic tale (and throws in some classic theatre tropes for good measure along the way). Venice tells the dystopian tale of a war-torn country (a fictional Venice), torn apart after a devastating terrorist attack. Fast forward to 20 years later when two friends, Willow, the daughter of the late president (he was killed in the attack), and Venice, a commoner, reunite after being separated in the aftermath of the attack. (Naturally, the elite, Willow and her ilk, were taken to a nearly hermetically-sealed safe zone; the others, like Venice, were left to fend for themselves in the ruins.) They plan to marry in order to reunite their beloved country and bring peace to their people. But someone has other plans. Indeed, you can still see definite traces of its Shakespearean roots, with the two-faced Markos plotting all sorts of evil machinations, just like Iago. Markos’s wife, Emilia, is, like her Shakespearean namesake, willfully complicit in her inaction. Markos uses pawns, just as Iago did, to manipulate Venice, his Othello. Yet it certainly does stray from Shakespeare’s story. For one thing, the casting turns the traditional racial struggles found in Othello on their heads. Willow (or Desdemona) is still white, but Venice is of Middle Eastern descent. Markos and his family are black. These choices do not lessen the tensions; they bring the stakes to the present and ask modern audiences to consider our own racial struggles and presumptions. Moreover, the story further diverges from Othello as it needs to in order for Rosen and Sax to tell their own story. 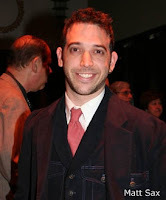 (Rosen also directs this production.) Their story is much more about the people and the politics and the leadership and governance (making it right up my alley). They also borrow some classic Greek conventions, albeit with modern tweaks. You may recall from high school English class that the Greeks used the Greek chorus to narrate and comment on the story. So too, do Rosen and Sax. Opting for a single narrator rather than a chorus (though there is a terrific ensemble), Sax himself is the Clown MC, helping move the story along and editorializing on the goings on. He begins by writing out the story, beginning with a prologue, typing away on a Macbook. The words are projected on supertitles throughout the theatre. It’s a useful tool. Not only does it help keep the audience informed, but it also reassures us that though difficult, complex issues are being brought to the front and violence is being depicted on stage, we are in a safe space in which to think about these things. And different words and phrases appear in the supertitle space (scenic design is by Beowulf Boritt) to add power and poignancy to pivotal moments. Bringing those moments and others to life is a cast that is on fire. Victoria Platt excels as Emilia, who struggles to balance being a “good” wife with being a “good” citizen. As Venice and Markos’s mother, Anna, Uzo Aduba (Godspell) is a paragon of strength, serving as the emotional center of the story. (Read my interview withAduba to find out more about the talented actress, including the story behind her name.) Haaz Sleiman (Nurse Jackie) brings a captivating intensity to the title role. The beautiful Jennifer Damiano (Next to Normal, Spider-Man) once again shows off her glorious voice, and taps into a disarming fragility in Willow. 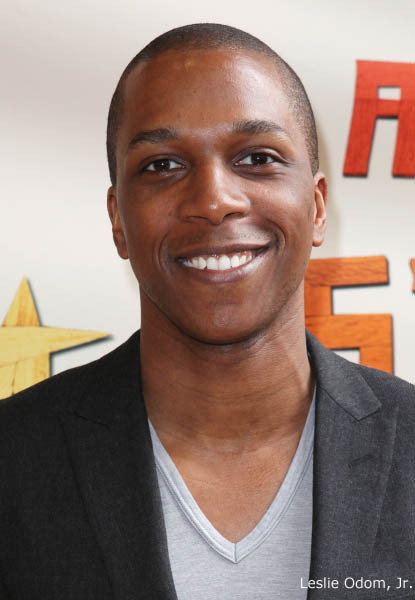 Leslie Odom, Jr. is perfect as the nefarious but charismatic Markos. (Basically, the Smash and Leap of Faith star should be cast in everything.) And as the sensitive Sax spits out the rhymes he wrote, you realize he could run circles around today’s illest MCs. As the Clown MC welcomes us to Venice, he cautions, “if you dream of peace, follow us. If you dream of freedom, follow us. If you know these aren’t the same thing…are you ready” His opening salvo poses the first of several tough questions we and the citizens of Venice will face. Questions like, what does it take to start a revolution? What are the true costs of war? Who can you trust? By the end, the Clown MC and the citizens of Venice entreat us to be great to one another, to be righteous and throw sun on the shade. Venice is an incredibly important show, and the bravest piece of expression I’ve seen in a long time. Venice continues through June 30. Visit the Public Theater's website to learn more about the show and to purchase tickets. And check out these photos of the cast in rehearsal!